Best HEIC Viewer on Windows/MacOS/Android, FREE! iPhone have captured photos in JPG format up until now. However, with the release of iOS 11, Apple broke the tradition and introduced a new format called HEIC. Although this new format has superior compression and can save a lot of storage space, there are some compatibility issues and many applications, devices, and operating systems may not support it. iMyFone HEIC Converter is one of the best tools to convert your iPhone photos to JPG. It offers 1-click conversion solutions and solves the compatibility issues with it’s convenient, fast, and efficient conversions. 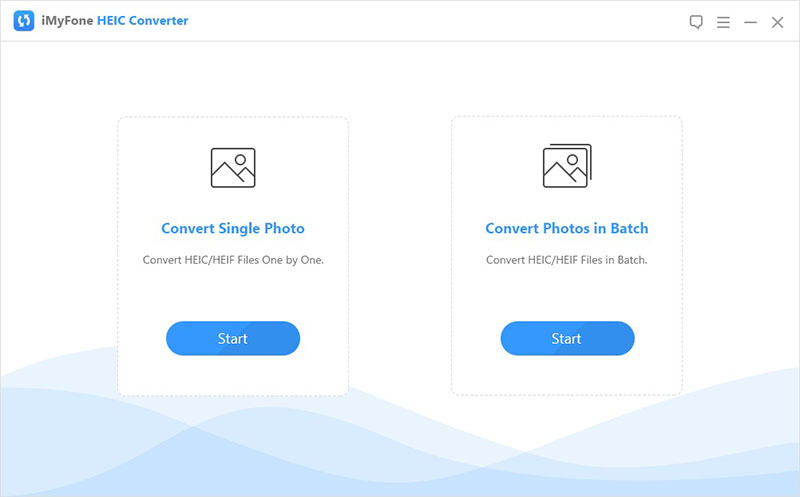 Convert your multiple iPhone HEIC photos to JPG with a single click via Batch conversion feature. There is no limit to the photos you can add. 100% secure conversion as you won’t need to upload your photos online. The conversion will be performed offline so you don’t need to worry about any privacy leaks. Preview your photos before conversion when using the first mode. Option to adjust the conversion quality. Supports all iPhones running iOS 11. Step 1: First, download and install iMyFone HEIC Converter on your PC then launch it. Step 2: Now choose ‘Convert Single Photo’ option of the software if you need to convert a single file. 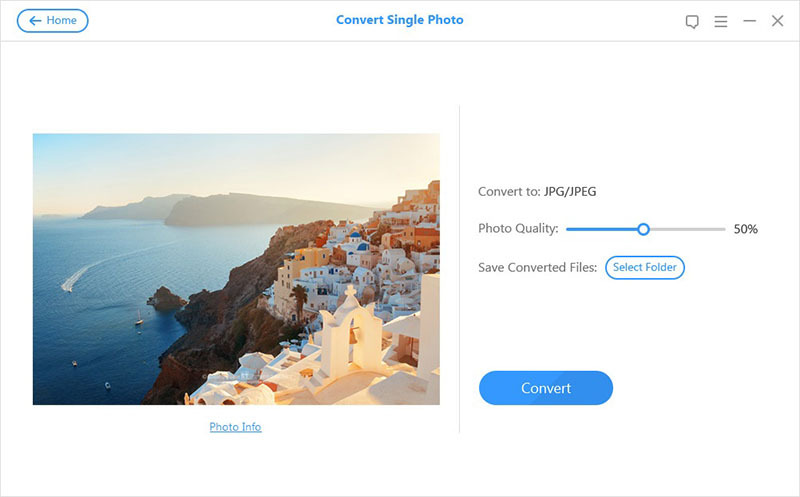 Or you can use ‘Convert Photos in Batch’ if you have multiple photos required to be converted. Click the ‘Start’ button afterwards. Step 3: A window will appear asking you to select a file by clicking the ‘+’ button or alternatively you can use the drag and drop feature to add photos as well. Step 4: After you add your photos, you will be asked to select the conversion quality as well as choose folder for your converted photos. Click the ‘Convert’ button once you have configured these options. Step 5: Once you click the ‘Start’ button, your photos will start converting to JPG. Once the conversion is finished, you will be notified. There is another way to convert your iPhone photos to JPG. However, you will need go online for that. There are plenty of online conversion sites you can use for this purpose. heictojpg.com is one such site that offers HEIC to JPG conversion. Step 1: Visit heictojpg.com in your web browser. 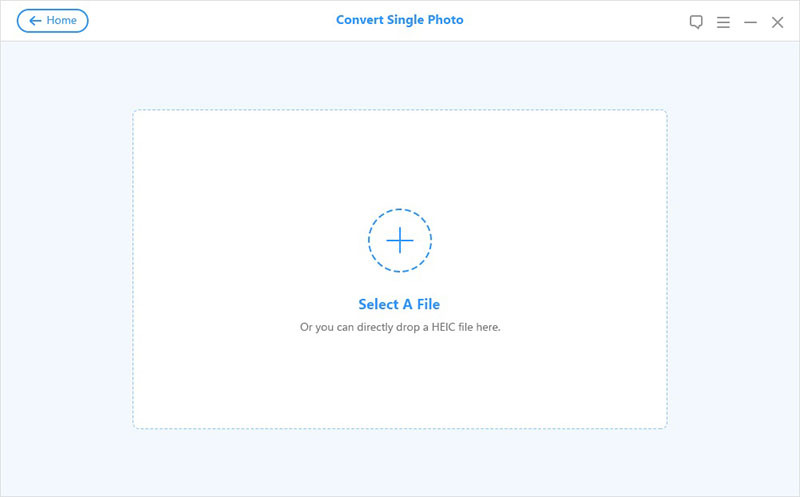 Step 2: Once the site is opened, you will see a box asking you to upload your HEIC photos for conversion. Step 3: You can either click the box to upload your photos or alternatively you can use drag and drop method to do this. Step 4: Upload the photos you wish; you can upload up to 50 photos for conversion. Step 5: Once the photos are uploaded, the conversion process will start and then you will be notified once the conversion is finished. You can then download them in your computer. While online conversions also get the job done and cover your HEIC to JPG conversion needs, there are some cons associated with this method as well. Online websites will upload your photos to their server for conversion. This is not safe as it has a risk of privacy leak. Online HEIC to JPG conversion are relatively slower as compared to offline conversions. Factor such as your internet speed also matter a lot in this as you will need to upload your photos and then download them after conversion. So the whole process will take a lot of your time. Most online conversion sites impose limits, for example heictojpg.com allows you to convert up to 50 photos once a time. You won’t be able to adjust your desired photo quality of converted photos. You can also configure your iPhone settings to take JPEG photos with your camera. This feature is only available in devices with iOS 11(iPhone X, iPhone 8/8 Plus, iPhone 7/7 Plus, etc.). Step 1: Select Camera menu from the Settings app on your iPhone. Step 2: Now choose the Formats option and then select Most Compatible from the listed options. 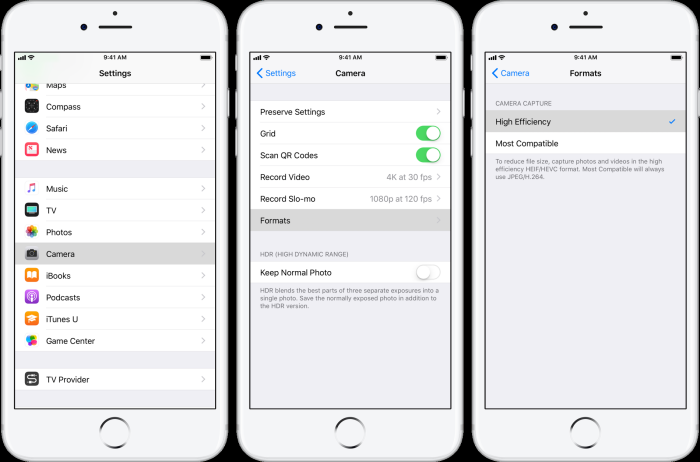 Configuring this will set your iPhone to capture images in JPEG format. 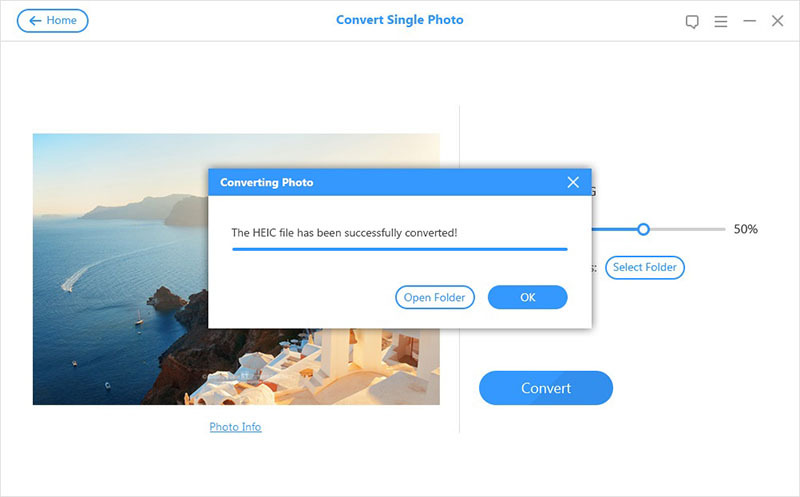 However, keep in mind that your existing HEIC photos will stay in the same format and will need to be converted for compatibility.